Ladies Dance Sneakers by Vida Mia. These are our premium line of dance sneakers. The all-leather construction gives you long wear. The perforated leather uppers lets the shoes breath. Special padding will cushion your feet and let you dance for hours. Made with a higher heel especially for followers. 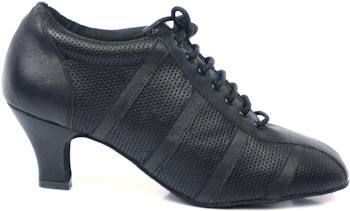 These give you the comfort of a dance sneaker, but are closer to the position that the feet are in when dancing with high heels. Available with optional red laces or white laces. These dance sneakers only come in a 1 3/4 inch (4.5 cm) heel (see photo above) with suede soles.